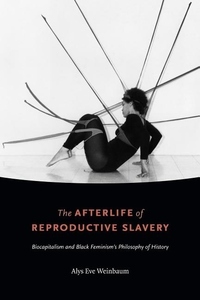 In The Afterlife of Reproductive Slavery Alys Eve Weinbaum investigates the continuing resonances of Atlantic slavery in the cultures and politics of human reproduction that characterize contemporary biocapitalism. As a form of racial capitalism that relies on the commodification of the human reproductive body, biocapitalism is dependent upon what Weinbaum calls the slave episteme--the racial logic that drove four centuries of slave breeding in the Americas and Caribbean. Weinbaum outlines how the slave episteme shapes the practice of reproduction today, especially through use of biotechnology and surrogacy. Engaging with a broad set of texts, from Toni Morrison's Beloved and Octavia Butler's dystopian speculative fiction to black Marxism, histories of slavery, and legal cases involving surrogacy, Weinbaum shows how black feminist contributions from the 1970s, 1980s, and 1990s constitute a powerful philosophy of history--one that provides the means through which to understand how reproductive slavery haunts the present.